SNK's revered Metal Slug series has already made one stop on DS in the form of Metal Slug 7, but there's been no downloadable outing for Marco and crew. While that's not looking likely to change, Cinemax is getting ready to transfer retail game Commando: Steel Disaster across to DSiWare later this year. The run-and-gun title from developer Mana Software was released in North America at retail but never made it to Europe, something Cinemax is hoping to rectify with a downloadable release. Here's the trailer from the DS original. We'll have more on this as we get it. Ooh, a run-and-gun adventure game, kind of like Megaman or Cave Story or, perhaps most like, Metal Slug. I like it. Looks really good. Imma keep an eye out for it!! I had totally forgotten about his game. Going by metacritic it seems to be even more difficult than the Metal Slug games. Doesn't look so from the trailer though. So for 8 € this is as good as bought. if it came out a year ago before the 3DS"
Seems to be an awful lot of D-grade DS titles coming the DSiWare. I picked this one up a while back $6 and its not very good and I can't say I'll ever want to play it again...one of those 5/10 sort of games. @TeeJay: Actually, you'd wanna think more like Contra for Metal Slug style. I wouldn't say that it's more difficult than Metal Slug, but far less forgiving. This actually looks pretty good! I'm willing to give it a download when it comes out. The 3 year anniversary of this game's US retail release is tomorrow (originally released: 8/25/2008)! I remember being one of the only people to pre-order it at my local GameStop at the time. It got a slightly wider release later, but no hype at all. You can probably still find it in bargain bins at big box retailers across the US. This company had to see the jokes coming. Looks like fun. May check it out. Otherwise - great, love to have this on my 3DS without swapping gamecarts. I'll get this when I see the review. Seriously, the lack of multiplayer was an awful thing to happen in Metal Slug 7, since a lot of the fun comes with playing with a buddy. If this has multiplayer, it'll be an instant-buy! Reminds me of Commando Steel Disaster, which was a cheap knock off of Metal Slug. Edit: Just looked it up, it's the same company, I will pass on this one. I miss Nazca. To me the Metal Slug series died after part 3, after then it's been clone after clone, official or not. @motang It probably reminds you of Commando: Steel Disaster because it is Commando: Steel Disaster. The game name is in the tagline and the end of the first paragraph too. Sweet. Please, please Nintendo give us a DSi SD card update so I can actually get this game and not have to play my least favorite DSi game, J.T.D.G.B.T.I.M.A.S.C. aka "Juggle The DSi Game Between The Internal Memory And SD Card". 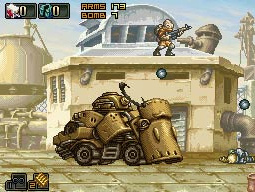 Looks really like Metal slug! Very cool! It certainly could be worth a download!